When using the universal installer of Corona Renderer, the Corona Image Editor (CIE) is by default installed into C:\Program Files\Corona\Image Editor, and a desktop shortcut is also created for it. Note: In versions of Corona prior to V3, the CIE was installed in the Corona root folder: C:\Program Files\Corona). CIE is a portable, standalone application which allows loading a Corona EXR (.cxr) file and applying all post processing operations which are available in the Corona Renderer VFB to it, including adjusting LightMix, running Denoising, LUTs, bloom and glare, without the need to re-render. All of this is done without running any 3D software. It can be seen as a standalone version of Corona Renderer VFB with extended functionality. Lower system requirements than working with an image inside any 3D software - it can be run and used on a less powerful computer. 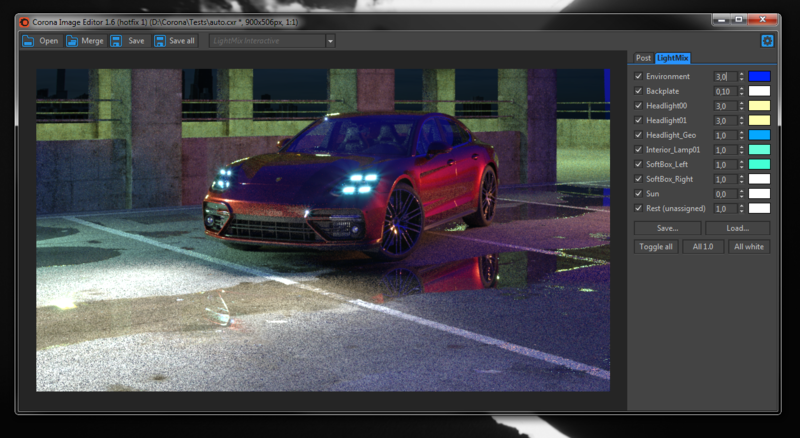 It is not necessary to have a scene loaded while you are working with your images, so you can denoise Corona renders outside of the rendering process, reducing the memory requirements significantly. No need to copy settings manually: CXRs from the VFB are automatically loaded with them. It also works with regular, non-Corona EXRs (in Float format). 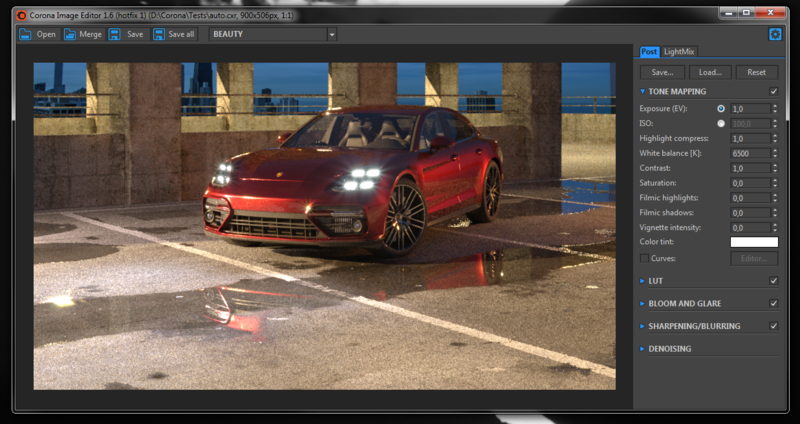 It is possible to add bloom and glare to them, apply your tone mapping settings, LUT, etc. 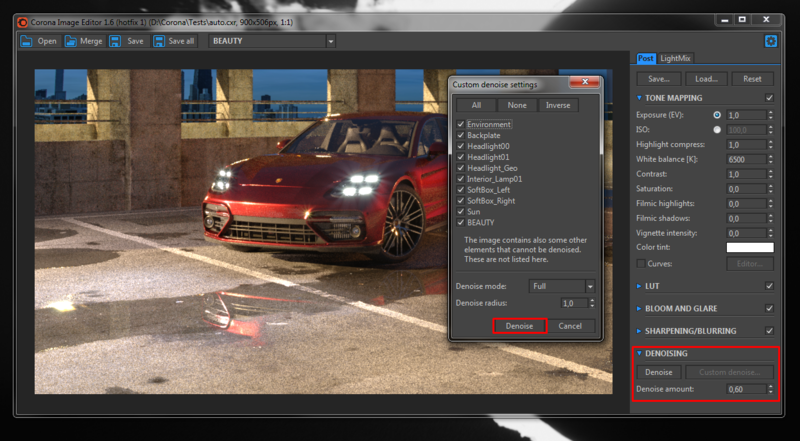 Denoising and LightMix are not available for such EXRs because they do not have the necessary “hidden” auxiliary data. You can associate the CIE with EXR and CXR files and open them just by double-clicking. Ctrl+O and Ctrl+S can be used for fast image opening and saving. It is a portable application, works with just unpacking, no installation necessary (license activation is required, though). It is free with a regular Corona license. In both 3ds Max and Cinema 4D, press and hold the Save button in the Corona VFB and select "Save CXR" from the dropdown menu. 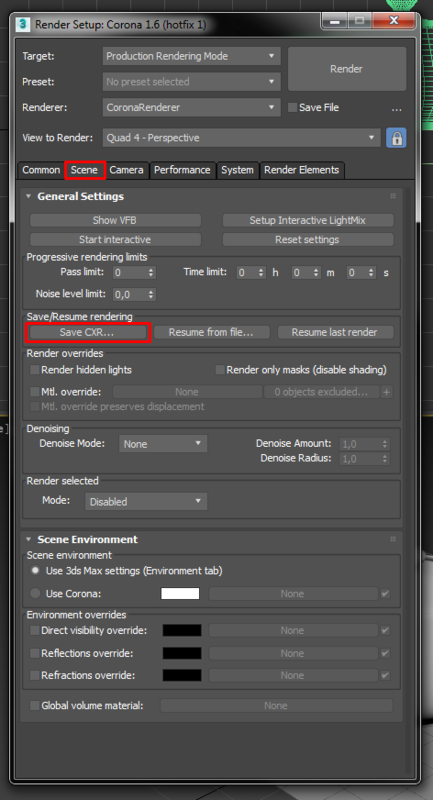 In 3ds Max only, go to Render Setup > Scene and press the "Save CXR..." button. In 3ds Max only, save the file as .cxr using the standard 3ds Max "save as" dialog. Note: you need to have the Beauty render element selected in the dropdown list in the VFB. If any other item is selected, only that single element will be saved in the CXR format, which will not allow for using the LightMix in CIE. 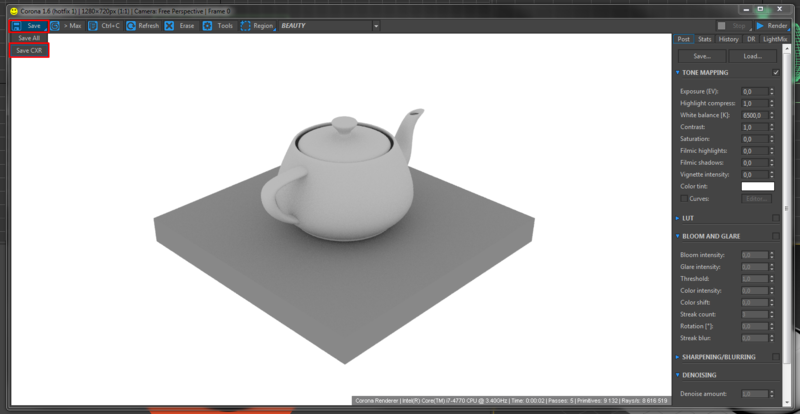 If you have saved an image in CXR format from 3ds Max or any other application without performing the actual denoising, and with "gather data for later" denoising option enabled, you can open this image later in the CIE and perform the denoising then.To do this, simply load your image into the CIE, expand the "Denoising" rollout in the "Post" tab, and choose either "Denoise" for automatic denoising, or "Custom denoise..." to specify which render elements should be denoised, and what settings should be used. You can save an image with all LightMix layers included and then adjust the LightMix settings in the CIE. To do this, simply load your image and select the "LightMix" tab. You will see exactly the same settings as in the Corona VFB, including the options to save and load LightMix presets. CoronaImageBatch - a script for batch image processing. It can be used to process multiple images at once using a custom .conf file, which can be saved using the GUI version of CIE, or edited manually. 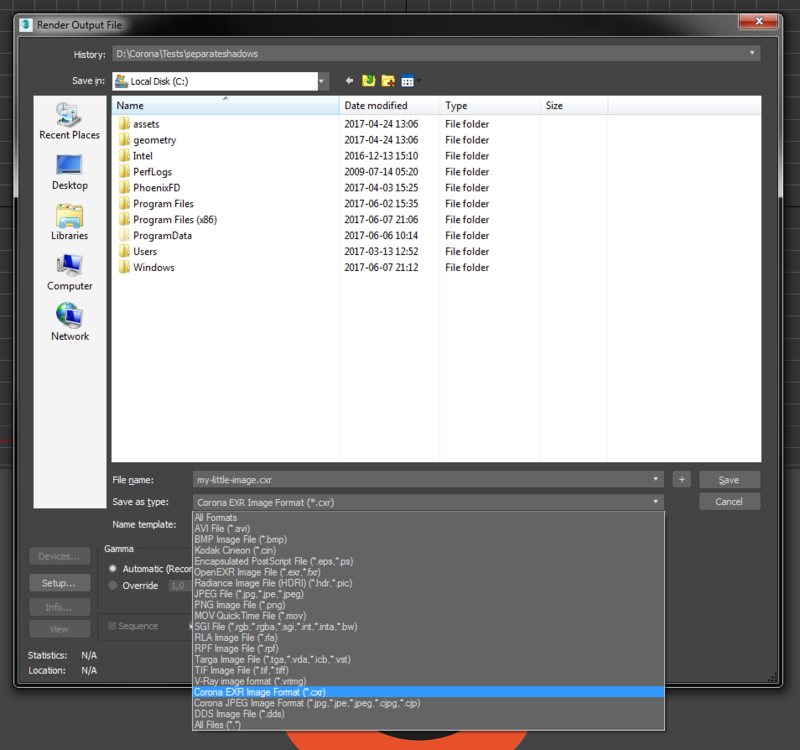 Help file and an example CXR file is included in the ZIP archive. Example use: save 100 frames of an animation in .cxr format, perform specific post processing operations and denoising on all of them, and output them in .png format.